Department of Social Sciences, Loughborough University, Loughborough. School for Policy Studies, University of Bristol, Bristol. Background Good communication is central to the effectiveness of GP service provision, as well as to patient satisfaction with surgeries, but very little is known about the actual communication that occurs between patients and surgeries. Aim This study was carried out to examine, for the first time, how receptionists interact with patients on the telephone, to identify features of communication associated with efficacy and patient satisfaction. Design and setting A qualitative conversation analysis of incoming patient telephone calls, recorded ‘for training purposes’, in three English GP surgeries. Method Data were analysed qualitatively to identify effective communication, then coded to establish the relative prevalence of communication types across each surgery. Results Analysis identified a burden on patients to drive calls forward and achieve service. ‘Patient burden’ occurred when receptionists failed to offer alternatives to patients whose initial requests could not be met, or to summarise relevant next actions (for example, appointment, call-back, or other query) at the end of calls. Coding revealed that ‘patient burden’ frequency differed across the services. Increased ‘patient burden’ was associated with decreased satisfaction on published satisfaction survey scores. Conclusion Patients in some practices have to push for effective service when calling GP surgeries. Conversation analysis specifies what constitutes (in)effective communication. Findings can then underpin receptionist training and improve patient experience and satisfaction. Given the centrality of GP receptionists to patients’ experiences of their GP surgery, as well as access to primary care, there is surprisingly little research on telephone calls between receptionists and patients. Survey-based research shows that the helpfulness of the receptionist, along with communication with the doctor, is the most important driver for satisfaction among UK patients.1 However, little is known about what constitutes such helpfulness; that is, evidence of what needs to change to improve patient experience regarding access to their GP. Issues of ‘experience’ and ‘satisfaction’ are routinely addressed using post-hoc surveys or focus groups and interviews.2 The disadvantage of such methods is that they do not tell us what and how problems occur in actual patient–healthcare provider encounters. Practitioners struggle to identify and action changes based on survey feedback alone,3 and knowing what to improve can be based on ‘hunches’ or ‘best guesses’.4 The objective of this study is to analyse how receptionists interact with patients and to identify effective practice that can then inform receptionist training. So far, ethnographic research has explored the range of tasks in which receptionists engage (for example, allocating patient appointments, relaying test results, managing repeat prescriptions), some concluding that the complexities and constraints in the receptionists’ job affect their ability to facilitate patient access.5–7 Although previous research identifies what might be perceived as challenging in receptionist–patient interactions, it does not identify how these challenges are dealt with more (or less) effectively; that is, what should receptionists in poorly performing surgeries be trained to do, to improve? The starting point in the present research is that front-line receptionists provide opportunities for good and bad experiences in the way they handle, for example, external constraints such as the availability of appointments and access to test results. Incoming telephone calls between patients and receptionists (2780) were audiotaped from three GP surgeries in England in October 2014. Neither patients nor receptionists were aware they were being audiorecorded beyond the normal ‘awareness’ of such calls being monitored (ethical clearance was granted by the NHS for the evaluation of the data). The recordings were anonymised digitally (swapping names of patients, surgeries, and locales for fictional alternatives). Table 1 provides a summary of GP surgery characteristics, including the number of receptionists and patients, number of telephone calls collected, and deprivation index (from the English Indices of Deprivation 2015).9 All three surgeries operated with online as well as telephone services for booking appointments, but most of the enquiries are made over the phone (Table 1). Patients’ first point of contact with general practice is the doctor’s receptionist, often over the telephone. Very little is known about these encounters or what might underpin patients’ experience of good or bad service. In some practices, patients have to push to get effective service from receptionists. Alleviating the burden on patients through particular communication strategies is likely to improve patient satisfaction. From each surgery, the first 150 calls (according to recording time) were selected for detailed analysis. In total, 447 calls were analysed (three calls were excluded as they were calls from other professionals). All selected calls were transcribed verbatim, and extracts for conversation analysis (CA) were transcribed using the standard system for CA, which encodes phonetic information about the way talk is delivered.8,10 Simplified extracts are presented in the Results section. The analysis begins with repeated viewing or listening to recorded data, with the technical transcript. It proceeds with systematic analysis of the activities that comprise the complete interaction (for example, greetings, requests, or offers) and shows how the design of an activity places constraints on the ways that responses can be made. By analysing the sequence of conversation turn by turn, CA can assess participants’ understandings within the interaction itself, rather than from analysts’ a priori interpretations of what is happening. Overview of patient enquiries in the analysed recordings. A ‘burden’ on patients to push for effective service was identified in two main phases of the telephone calls. The first was near the start, in which first requests were not met by receptionists. The second was at the end of calls, when the appointment or service had been completed but some detail remained unclear to the patient. In these cases, receptionists moved to close calls prematurely, leaving patients needing to push back into the call for additional information or confirmation. Examples of each type of burden are provided and of how more effective receptionists acted to anticipate or remove such burdens. 6 Friday afternoon or teatime please. 16 R: (We’re) fully booked. 24 worth me ringing Flaxton. 30 R: It’s just Friday mornings. 32 P: Oh right, [ o ]kay. 34 R: Sorry we’re [fully booked] there. 42 R: [B ]ye, bye. Having requested an appointment (lines 4–6), R checks which Friday P is referring to and then tells P that they are ‘fully booked’ (lines 11 and 12). At line 13, a gap of 1.6 seconds opens up, in which R could offer a different date (or make an alternative action to, for example, ask about urgency). In other words, R could progress the call to a conclusion that involves giving a better service for P. R moves, however, to close the call (‘[ ]’ represents overlapping talk). R reiterates that they are fully booked (line 16) and moves to close the call (‘Okay’ and ‘thank you’, lines 19, 22). P sounds reluctant to close (line 21). At lines 21–23, she pushes back into the call, overlapping the end of R’s turn, to ask if it is worth calling the sister surgery. This is the phenomenon of interest: rather than R offering an alternative course of action, the burden is on P to keep the call going and push for service. P’s alternative suggestion is also rejected, however, by R (lines 25–28). R rejects the possibility of P getting an appointment at Flaxton, again without offering any alternative course of action. This time P goes along with R’s closing. 11 R: =to look for the week after. Following P’s request for an appointment, R informs her that Dr Wilkinson is not available to pre-book during the current week. Rather than let a silence open up or initiate a closing, however, R moves immediately to offer to look for appointments the week after (lines 5–8). 14 R: .ptk All right? 15 P: Uh when shall I ring. The receptionist suggests that P waits until the middle of the week (lines 2–3), and that they will otherwise ‘start to chase it up’ (lines 9–11). P accepts this offer (‘Okay’), which is followed by R’s closing-implicative ‘All right?’. What is missing, however, is precisely who should call whom and when next, which P asks about subsequently. Instead of joining in with R’s closing moves, P seeks to specify when to best get in touch, asking ‘Uh when shall I ring’ and suggesting ‘tomorrow or-’ (line 16). In other words, it is not clear to P how to interpret ‘middle of this week’. Following R’s suggestion of a time to call back, P accepts (line 20) and R initiates call closing (line 22). This time, P joins in with the closing. But the burden is on P to push for this confirmation and to make the follow-up call. In over half of the appointment-making calls, receptionists summarise appointments only in response to patients pushing for such confirmations. Extract 4 is one example, where P has made an appointment and now R asks for his address. 1 R: What’s your address please. 3 P: Eighty four Tern Way. 9 P: That’s the sixteenth? 10 R: =The sixteenth, [at ten pa]st eleven. 13 P: Ten past eleven, thank you. Here, R treats the call as completed (lines 4 and 7), but P wants his appointment confirmed (lines 6 and 9). Like Extracts 1 and 3, there is a ‘crash’ in the call, where both speakers talk in overlap, and therefore pursue different actions to complete. Here, R attempts to close the call while P, in overlap, opens up further business. R confirms P’s appointment details (lines 8–9). Some evidence for P’s satisfaction comes in her response ‘thank you very much’, in contrast with truncated ‘thanks’ (Extract 1, in which no appointment was made) or ‘thank you’ (Extract 4, in which P had to push for confirmation). These internal measures of satisfaction are interesting; patients ‘thank’ receptionists in almost every call regardless of whether they have obtained the service they want, but more effusive thanks are present in more effective calls. Conversation analysts identify, from the internal workings of interaction, (in)effective practice. ‘Patient burden’ and its resolution constituted (in)effective communication in patient–receptionist interaction. To provide external corroboration for these endogenous measures, satisfaction scores were collected from the GP patient survey for the three surgeries (https://gp-patient.co.uk), using the January 2015 survey because of temporal proximity of fieldwork with time of telephone recording. Two items were the focus: ‘X% describe their experience of making an appointment as good’ and ‘X% find the receptionist at this surgery helpful’. GP3 had the fewest instances of ‘patient burden’ (15/150 calls), followed by GP1 (28/149 calls) and GP2 (46/148 calls). The difference between the services regarding ‘patient burden’ was statistically significant (χ2 = 16.337, degrees of freedom = 2, P<0.001). Comparing the relative frequency of ‘patient burden’ across three surgeries, a strong association was found with the independent patient satisfaction scores. 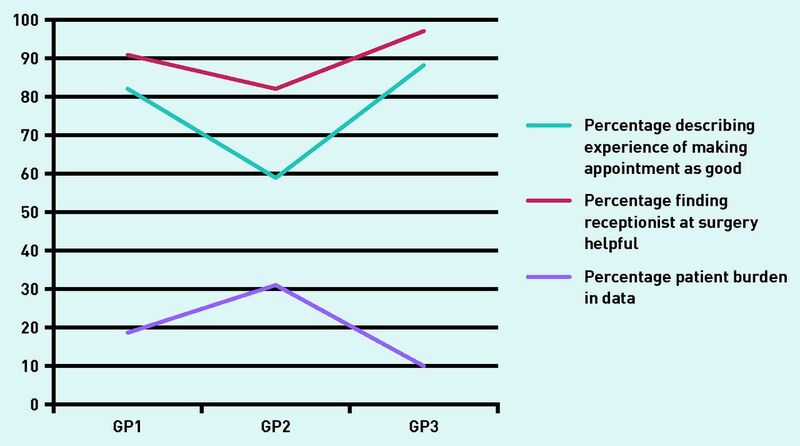 Figure 2 shows that GP3, with the lowest ‘patient burden’, scored the highest on the survey (88% for ‘experience of making an appointment’; 97% for ‘finding the receptionist helpful’), followed by GP1, with more ‘patient burden’ (82% for ‘experience of making an appointment’; 91% for ‘finding the receptionist helpful’), and GP2, with the most ‘patient burden’ (59% for ‘experience of making an appointment’; 82% for ‘finding the receptionist helpful’). Satisfaction scores from the GP patient survey, for three surgeries, compared with ‘patient burden’. The main finding of this study is that receptionists can increase or decrease the burden on patients to achieve effective service at the GP surgery. It identifies one aspect of what constitutes effective communication in GP receptionists’ telephone encounters with patients. Less effective receptionists failed to offer alternative courses of action when they could not meet patients’ first requests, leaving the burden on patients to drive the call forward. They also closed calls prematurely, before confirming the details of next actions (for example, the time and date of appointments). In the more effective calls, receptionists made alternative offers and summarised patients’ appointments or confirmed what would happen next. Higher frequency of ‘patient burden’ was associated with lower published patient satisfaction scores. Before conducting this study, it was known that surgeries offering basically the same service differed in their satisfaction ratings. But, without looking at the data, how would one know what made the difference? The study’s strengths are in its analysis of actual, real-time encounters to identify effective practice, rather than relying on post-hoc reports of or surveys about communicative encounters. Practitioners struggle to identify and action changes based on survey feedback alone.3 Social scientists have shown repeatedly that accounts elicited in focus groups, surveys, and interviews cannot reproduce interactional specifics.13 By instead focusing on real-time encounters, gaps between patients’ frustrations regarding access and often unreliable survey methods can be filled.14 Although data were gathered from only three practices, what is identified as effective could well be relevant beyond them. In the future more statistically-centred studies, based on a larger group of surgeries, could further demonstrate the relationship between patient satisfaction and particular features of patient–receptionist encounters, and test the effectiveness of changing these encounters accordingly. In the authors’ knowledge there are no other studies of patient–receptionist telephone enquiries, but a study of face-to-face front-desk talk found that receptionists are typically direct and task-focused, rather than rapport-building.8 It is argued that patients appear most satisfied when service is offered quickly and pre-emptively, rather than in response to pushing for it, which is a more specific finding. The evaluation was funded by the Higher Education Innovation Fund via Loughborough University and by NHS North Derbyshire CCG. Consent was granted by the National Research and Ethics Service to use the calls for ‘service evaluation/improvement methodologies’, in line with national guidance, and the study was granted ethical consent from the research governance office at Loughborough University (ref: C15–18). Revision requested March 30, 2016. (2015) Drivers of overall satisfaction with primary care: evidence from the English General Practice Patient Survey. Health Expect 20(5):1081–1092. (2013) What patients want. Patient Educ Couns 90(3):287–290. (2015) The role of patient experience surveys in quality assurance and improvement: a focus group study in English general practice. Health Expect 18(6):1982–1994. (2008) A room with a viewpoint: using social norms to motivate environmental conservation in hotels. J Consum Res 35(3):472–482. (2013) Slaying the dragon myth: an ethnographic study of receptionists in UK general practice. Br J Gen Pract doi:10.3399/bjgp13X664225. (2009) Front desk talk: discourse analysis of receptionist–patient interaction. Br J Gen Pract doi:10.3399/bjgp09X453774. English indices of deprivation 2015, https://www.gov.uk/government/statistics/english-indices-of-deprivation-2015 (accessed 25 Jul 2016). (2004) in Conversation analysis: studies from the first generation, Glossary of transcript symbols with an introduction, ed Lerner GH (John Benjamins, Amsterdam/Philadelphia), pp 13–31. (1977) The measurement of observer agreement for categorical data. Biometrics 33(1):159–174. (1996) A guide to chi-squared testing (John Wiley & Sons, New York, NY). (2005) Qualitative interviews in psychology: problems and possibilities. Qual Res Psychol 2(4):281–307. (2016) Patient feedback for quality improvement in general practice. BMJ 352:i913. , ed (2011) Applied conversation analysis: intervention and change in institutional talk (Palgrave Macmillan, Basingstoke).